Big Bend National Park Highlights is the perfect introduction to Big Bend National Park, and two iconic features: Santa Elena Canyon and Chisos Mountains. Experience three distinct environments: desert, mountain, and river. Learn the fascinating history of this unique region, from Spanish conquistadors to Apollo astronauts. Enter Big Bend National Park (entrance fees included in trip cost), take the Maverick Road (dirt), to Santa Elena Canyon, with stop at Luna's Jacal. Noted author Edward Abbey wrote that "If light were sound, Santa Elena would be a symphony." 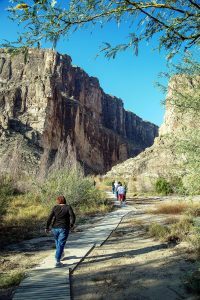 We will hike the 1.5 miles round trip into the canyon, one of the most remarkable scenic locations in Big Bend and the state of Texas. A picnic lunch will be served by the Castolon store. Castolon was once the commercial center of agriculture along the Rio Grande that supported the mining industry in Terlingua and also grew cotton for export out of the area. During a period of unrest between 1913 and 1918, a small detachment of cavalry was posted here and patrolled the US/Mexico border. From Castolon, we drive Ross Maxwell Scenic Drive, stopping at overlooks with spectacular scenery along the way, en route to Chisos Mountains Basin. 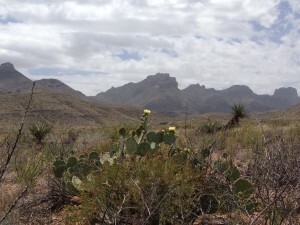 The Chisos Mountains Basin is in the cool mountain highlands of Big Bend National Park. There is a lodge with 72 rooms, restaurant, and convenience store. The Basin is the jumping-off point for a variety of wilderness trails. We will take a 1.5 mile round trip walk to a scenic viewpoint on the Lost Mine Trail, where on a clear day, you can see 100 miles in all directions. This open-air museum guides visitors through millions of years of geology, with displays and sculptures depicting habitats of these remote times, and the creatures who once inhabited them. Along the way,we stop at Park HQ at Panther Junction to enjoy an excellent short video and shop for interpretive literature, maps and park related gifts. Return through the west side of the National Park and exit TX 118 north, then left at Study Butte on TX 170. Guests will arrive at Lajitas Golf Resort by 6:00 pm. Times are estimated. We are always happy to be flexible with the itinerary; as long as we get you back in time for dinner. 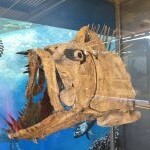 We are happy to arrange custom itineraries and exclusive tours.